The only text on the front of our atelier (font size 5mm-10mm). Zürichstrasse reflected in the background. This week we updated the press section of our website. The overview is free from “marketing speak” which could slow a journalist down as she composes her story. Our target is to tell journalists who ochs und junior is. It is the journalist’s prerogative to decide what to make of that. This is similar to how we present Ludwig Oechslin’s watches. 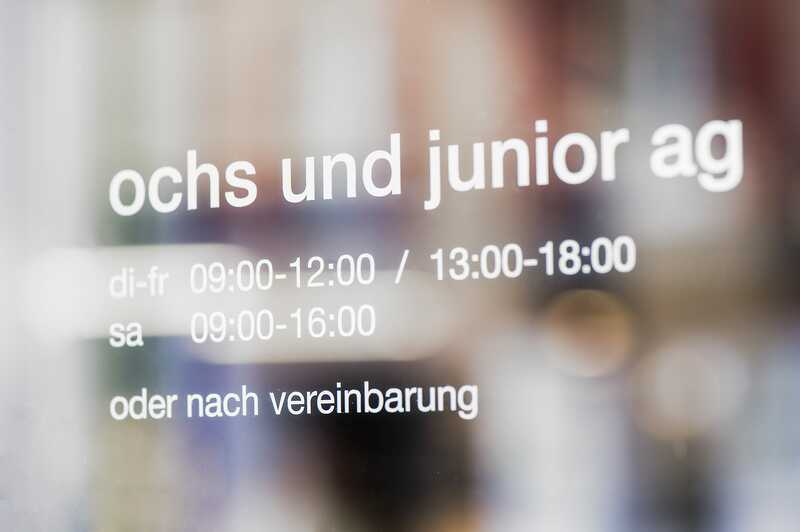 We want to enable people considering ochs und junior watches to put them to a good test. Journalists writing for HODINKEE, Bloomberg, the New York Times and more have introduced ochs und junior to watch fans around the world. If you are a journalist and there is something we could do to help you perform your job better, please let me know. The second new feature we launched today is the ability for the press to directly sign-up to receive press announcements. We don’t restrict access to our announcements. Just tell us who you are, and we’ll gladly add you to our press list. Our clients and fans can stay informed via our newsletter, as always.